Mizzou Libraries now provides online access to the Library of Latin Texts Collection, which includes five databases. Library of Latin Texts – Series A contains over 3,200 works that can be searched full-text. All works presented in this database benefit from scholarship by the Centre ‘Traditio Litterarum Occidentalium’ or (CTLO). All paratextual elements are distinguished from the original text. Coverage spans from classical antiquity to 1965. Library of Latin Texts – Series B is a supplement to Library of Latin Texts -Series A that is sourced from existing scholarly editions. This database collects Latin text of all genres and periods and adds 4-5 million words to the searchable corpora per year. Cross-Database Search Tool facilitates simultaneous searching among the two databases. Database of Latin Dictionaries contains the full text of 10 Latin dictionaries. Read more about this ongoing project of the CTLO on the publisher’s website. Database of Medieval Latin from British Sources covers medieval Latin sourced from British authors works and papers from 540 A.D. to 1600. The interface can be configured to several languages (English, French, German, and Italian) and can be searched by Latin and non-Latin words. 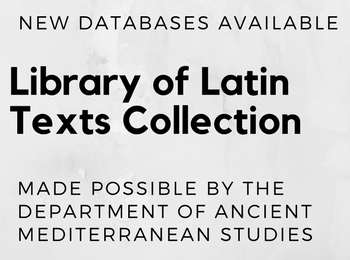 For more information on each database and its coverage and scope, see our guide to the Library of Latin Texts Collection. Access is provided thanks to a generous contribution from the department of Ancient Mediterranean Studies.